Look no further than Doug's So Cal Painting. If you want a top quality painter who has served the Southern California area since 1980 you have found us! We guarantee all of our customers' satisfaction on each and every one of our jobs. At Doug's So Cal Painting we always answer the phone. We can do any type of home painting, , at any job site; Residential and Commercial. To help set you at ease we are fully licensed bonded and insured. Contact us for your free estimate and let's figure out how we can be of help to you! Comments: I just had my house painted by Doug and his team. They did an amazing job and Jason, Doug's paint team lead helped me work through a couple of decisions on paint colors that didn't work out. I was so happy with his suggestions and am super happy with the outcome. They also finished in 3 days and were friendly and efficient. I would recommend them to anyone. Great job, Doug!!! Comments: Unfortunately can't give this contractor anything but 1. Hiring this painter became nothing but a nightmare. They were hired to do paint and texture in a master bath and also to install new floorboards. The texture work was maybe 5 of 10 stars. The pattern is inconsistent and honestly, I could have done much better myself. I don't have much free time so they were hired in the hopes that a professional job could be done quickly. Unfortunately it wasn't. I had to have them come back a few weeks after the work was done to fix a lot of the texture work that was just awful. The painting wasn't much better. When I hired them I made sure to focus on the fact that I needed all the lines to be straight. I needed my bathroom to look new since I was spending close to $20K on it. The lines around the floorboards and at the ceiling look like they barely used tape. Again, I could have taken time and done a better job without much real painting experience. Their prices were not cheap, but I feel the work they did was. To finish off what became a nightmare, their worker who installed my floorboards used long nails and punctured one of the copper pipes that transports the freon for my air conditioning. After a few weeks or back and forth, because Doug would not do the right and moral thing and pay for the damage his worker had caused, they eventually paid for half of the damage. So I am out $600 because of their incompetence. They claimed the home was built incorrectly and therefore the damage is the builders fault. But I spoke with 4 different contractors and they confirmed that this is the floorboard installers fault. Steer clear of this company. They'll put a few hundred dollars before making their customer happy and before doing the moral and correct thing and covering the damage their workers do to your home. The texture work was no better than 5 of 10 stars and the same with the painting. For the prices they charge, you're better off doing the work yourself or hiring someone cheaper. They were not worth the money and that was before they destroyed my air conditioning. Work Description: Painted exterior of my home. Comments: I couldn't be more pleased with the job Doug's crew did of painting the exterior of my home. They showed up whien they said they would; did the job I expected and actually did a few extras at no extra charge to me. I couldn't be more pleased with the finished job and I highly recommend Doug's So Cal Painting. Comments: Doug met me on time,as previously stated. Comments: As a home owner you want to make sure you get the best possible job done, one that looks nice and will last. After getting several quotes, and researching local painters and their licenses we picked Doug and his crew. They were prompt, professional and extremely pleasant to work with. All of our concerns were discussed. They provide very detailed work. We couldn’t be happier with the job they did. Our home is beautiful! Thank you so much Doug and crew. You will be the only call we make for further paint needs. Comments: I was very impressed with Doug and his team. They were very professional and clean. I love the look of my house. They did an amazing job. I have already had two people knock on my door to ask who did the work. I would highly recommend Doug So Cal Painting. Don't look any further! Thank you for allowing us to do the painting on your home ,it was a pleasure working with you. 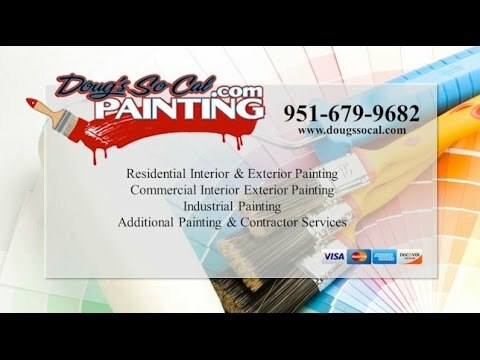 if you need any other work please give us a call at 951_679_9682 thanks for the review doug.from dougs so cal painting. Work Description: Good price, very friendly and on time! Work Description: A single story house, two colors inside: ceilings, walls and the garage. Comments: We looked into having our new home painted in two colors inside ceilings, walls and the garage. Doug was very accommodating, attention to detail and exceeded our expectations. The house is beautiful! The end result was a professional job. We will be using Doug’s So Cal Painting for all our painting needs. Work Description: Doug and his helper did the job as they said they would and I was satisfied with the painting of the eave. It was difficult because it was at the second story. Comments: However, I asked him if he would be interested in follow-on work and he said he would paint the remainder of the eave over the deck, but that was two weeks ago. I am no longer interested in him doing the follow-on work and I will find aother contractor. Work Description: Doug and his team cleaned remaining Swallows' nest residue, painted the four foot eave and enclosed with wire mesh. Comments: There was well done and timely. Work Description: Painting of exterior of house and security doors. Comments: Doug took a great deal of time answering all my questions and was extremely patient. I like the fact that I did not have to put money up front. Doug has a wonderful team of young men, who arrive on time, are courteous, and do an exceptional job. My home looks wonderful and I highly recommend him and his team! Comments: I would use him again. Work Description: Our homes exterior painted. Aluminum patio awning which was chipping was prepped and painted. Wood shutters were removed and repainted. Comments: Doug and his crew were very professional. They did a great job and paid attention to detail. Job was finished on time and everything was cleaned up. I would highly recommend Doug's So Cal Painting and his crew to anyone. Thanks a lot guys, it was a pleasure doing business with you. Comments: did an awesome job! Very nice and friendly!!! Would definitely recommend him to others looking for painters. Work Description: We had our exterior of our house pained in 4 colors. They had to primer the new wood patio first . These guys were so fast and so good. They prepped one day and finished in one day. Job is done very nicely and I never had to clean up after anyone. Comments: The price was very good, paint used is a good name brand paint. They left us touch-up paint of all the colors. My colors were good. The trim could have been darker, but they used what I choose and all is good. Thanks for such a great Job. Hope I can get Doug and his crew some referrals. Work Description: Both interior and exterior painting of the entire house. Comments: Doug and his crew were extremely professional and clean. The estimate Doug originally gave us was good, but he didn't estimate needing additional coats of paint in the bedrooms so the overall price increased at the end. They completed the job in record time though and I would recommend them. Comments: Doug and Ryan were professional and quick. Doug came to give me an estimate the day I called him and then came to do the job the next day. I'm very happy with the work and would definitely use Doug's SoCal Painting again. Comments: good job and fast!! Work Description: Scraped paint from top of deck. Replaced old boards. Repainted with two coats of paint. Comments: Appointment set up quickly and work completed in a very timely manner. Comments: Great Service and Price - Everything as Promised. Highly Recommend. Work Description: Painted complete exterior of home including trim and windows.